Technically, City Hall is not located within a city nor does it even serve a single city. It was completed in 2002 as part of the More London development between Tower Bridge and London Bridge – which is privately owned – so it is not even owned by a city! Margaret Thatcher abolished the Greater London Council in 1986 and presumably hoped to be rid of its troublesome leader, Ken Livingstone, forever. The Greater London Authority was created in 2000 as London’s strategic regional authority though and, consequently, Ken returned as the first Mayor of London. City Hall opened as its headquarters two years later. 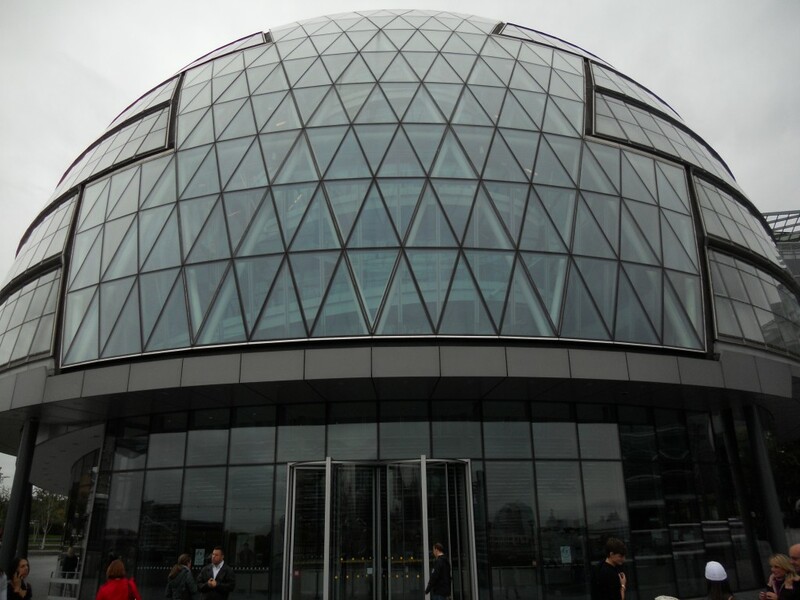 The prolific architect Norman Foster designed City Hall and it was built at a cost of £65 million. It is just one building on a long list of London landmarks by Foster which also includes Canary Wharf Tube Station (1999), the Millenium Bridge (2000), HSBC’s headquarters at 8 Canada Square (2002), 30 St Mary Axe (the ‘Gherkin’ – 2004) and Wembley Stadium (2007). Compared to County Hall, the headquarters of the old Greater London Council, City Hall is highly unorthodox. It has no external right angles and a 400m long internal walkway. 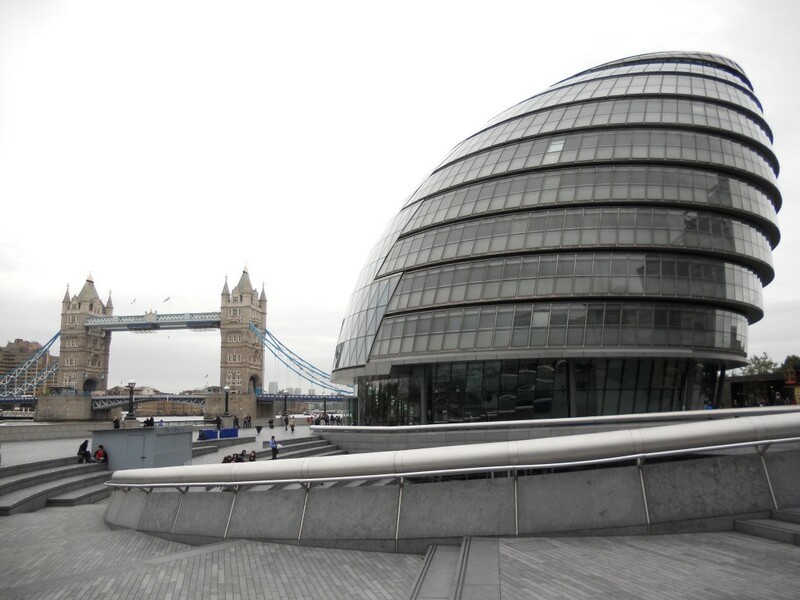 The building appears small but is apparently home to 600 staff along with the Mayor of London and the London Assembly. Its interesting shape, a modified sphere, is aesthetically pleasing and practical too as it has 25% less surface area than a cube of the same volume. Other eco features include two bore holes below from which water is drawn to both cool the building and fill its toilets. Photovoltaic panels were added in 2007 to provide electricity. The design may well be sophisticated but it does have one famous drawback. I had seen for myself that the windows are often quite dirty but I was shocked to learn that the current cost of cleaning them each year is nearly £140,000. A cherry picker was in action when I last visited but the process is by no means simple and a number of techniques are used. City Hall may well have dirty windows but it is without doubt an iconic structure and a pleasurable space in which to work (so friends tell me anyway). It is surrounded by notable buildings and, indeed, building sites. The Shard is under construction a couple of blocks away and, at 310m when completed, will be the tallest building in London. A quite dreadful feature of Brighton is the dreary series of imposing office buildings overlooking Preston Park. There were once Victorian villas and now only one remains at the foot of Lovers Walk. Lovers Walk is a gem of a road. It was once a footpath leading to Seven Dials but was transformed dramatically when the railway was built through it during the late 1830s. It became a cul-de-sac when the upper goods yard and Dyke Road Drive were built in 1878. Several distinctive properties are situated above the aforementioned villa including a delightful set of flint cottages. No. 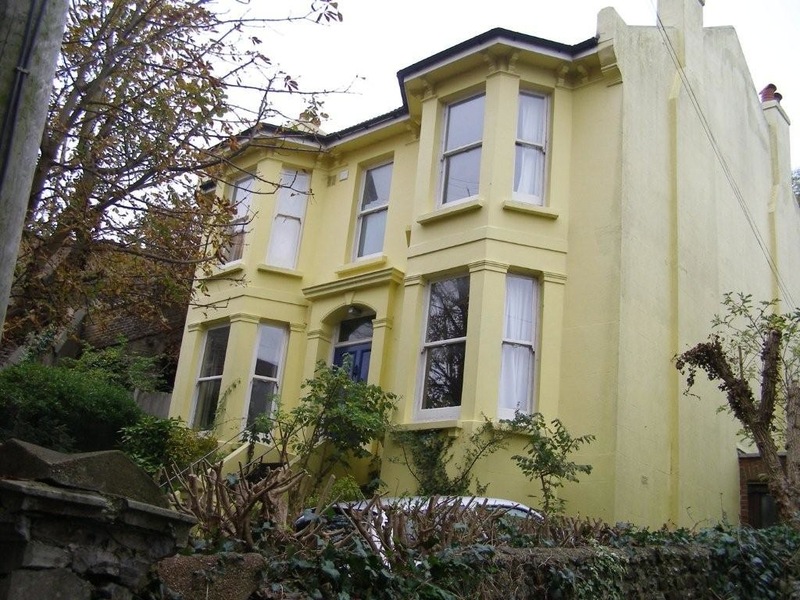 3 is another large detached double-fronted villa and is tucked away at the top of the road, adjacent to a steep flight of stone steps which leads up to Dyke Road Drive above. 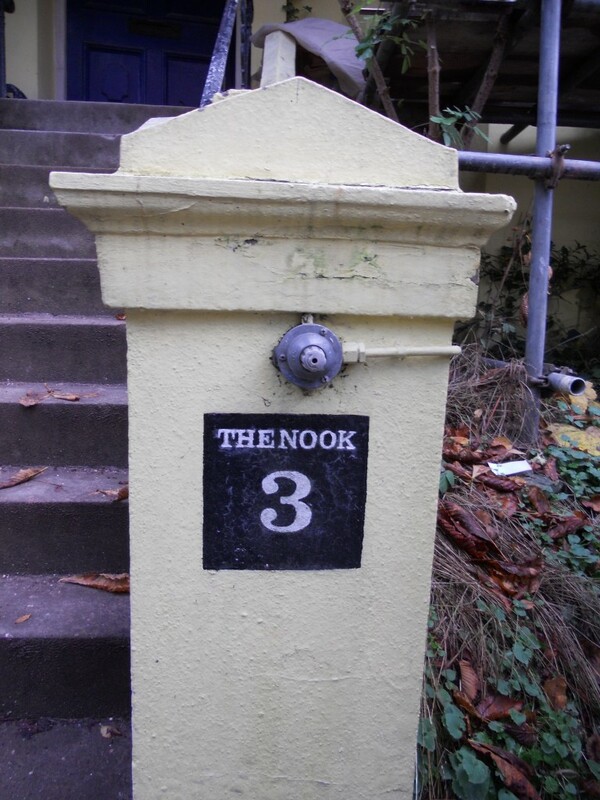 Quite appropriately, it is named ‘The Nook’. The Nook has been owned by Two Piers Housing Co-operative since 1984 and is currently undergoing major works. It is not a restoration or conversion though. The works, paid for by a Technology Strategy Board grant, relate solely to improving the house’s eco credentials. I heard about this building through Mischa Hewitt whom I first met when I wrote about the Brighton Earthship in Stanmer Park. Mischa is a Director of Earthwise Construction, the firm responsible for the building work on this project, and he kindly showed me the building’s various eco improvements. 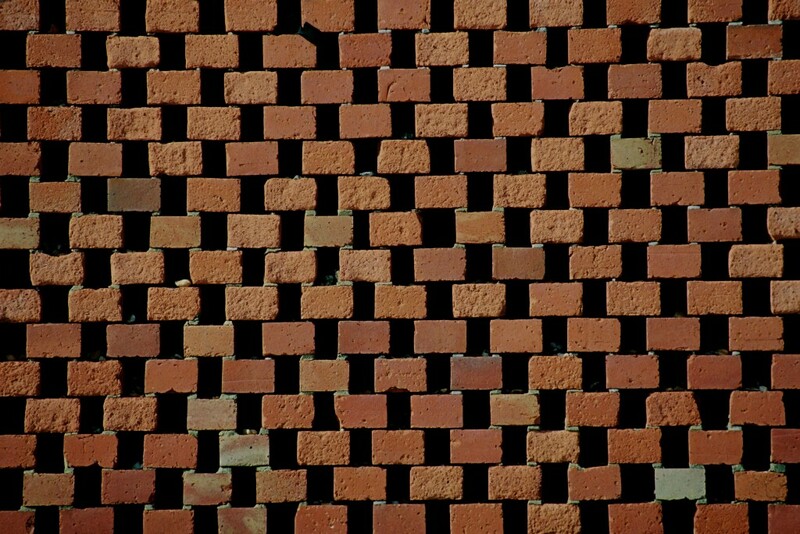 James Rae at BBM Architects, a quite appropriate firm for eco work, was responsible for much of the design work. The sides and back of the house have been smothered with five inches of thick exterior insulation. The front of the building, due to its ornate features, has been insulated from the inside. The sides and back of the building have triple-glazed NorDan windows whereas the front has double-glazed Vrogum windows. As one might expect, the roof is now home to a solar thermal panel. As a committed conservationist, I would have been looking to replace the missing balustrades on the front steps and change the concrete roof tiles for slate. But this project is not about history, it’s simply about reducing the energy foortprint of this house (to 17kg of CO2 per annum apparently). It is unique in the way that the money – no small amount – has been spent solely on environmentally-friendly features. It may not all be pretty, but it’s certainly warm and, therefore, a success. Saltdean owes its existence to an ambitious property speculator called Charles Neville who dreamt of developing all of the coastal land between Rottingdean and Newhaven. 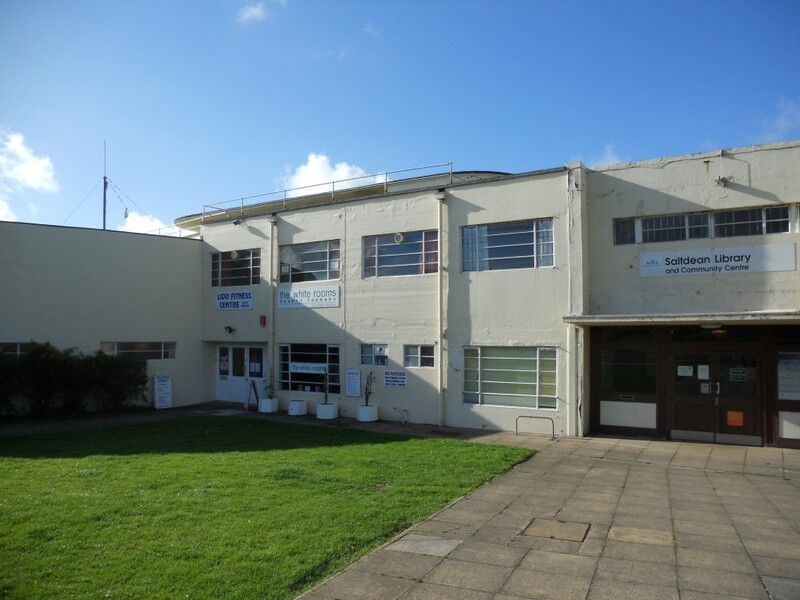 Several extremely fine Modernist structures built by Neville’s Saltdean Estate Company can be attributed to one particular architect – Richard Jones. 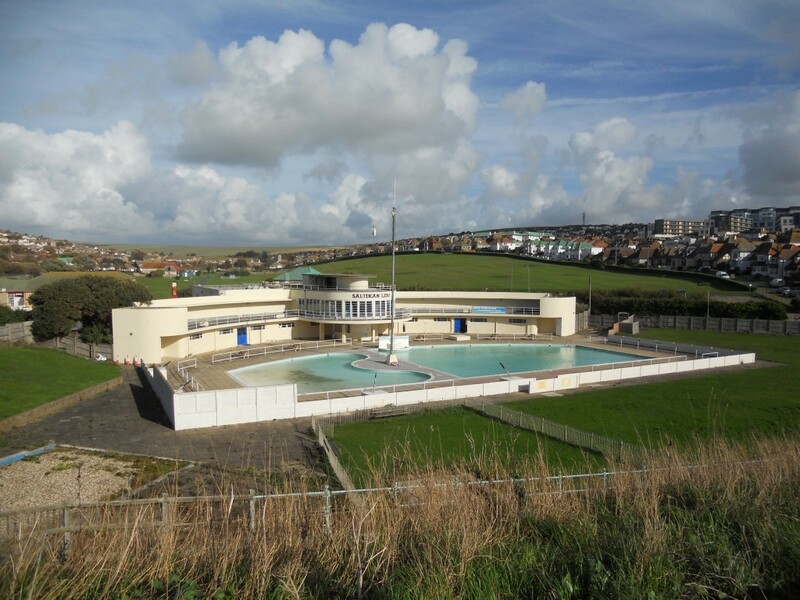 R. W. H. Jones was responsible for Saltdean Lido and the nearby Ocean Hotel, which opened in 1938 and 1939 respectively. In Rottingdean, he designed the St Margaret’s block of flats which was completed in 1938. Each has the unmistakable ship-inspired features which define the style. 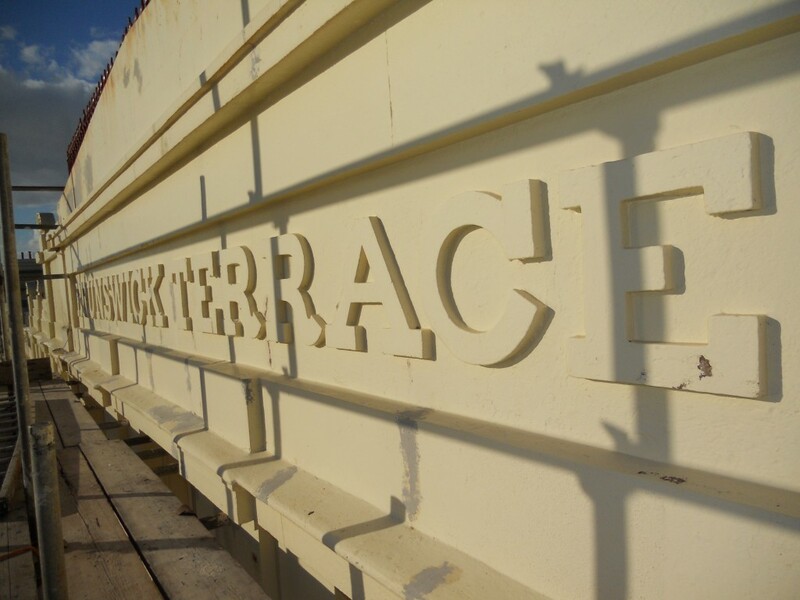 The Ocean Hotel is now gleaming following a huge conversion project. 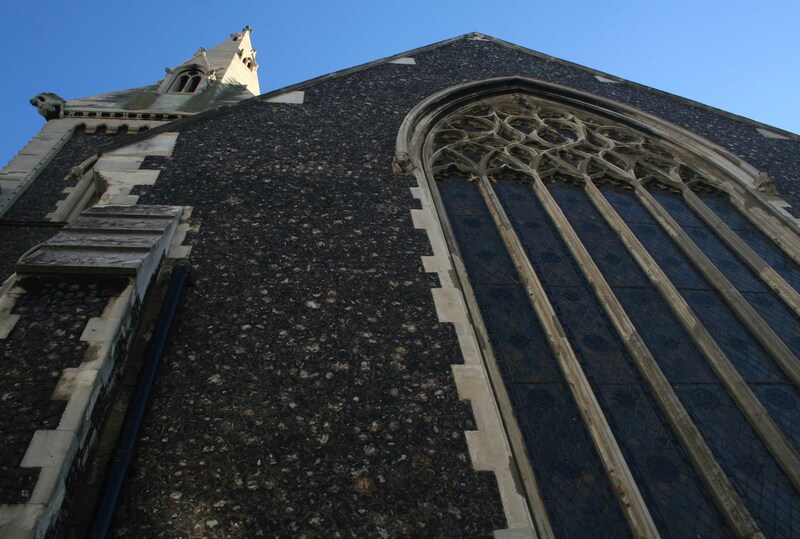 St Margaret’s has been restored over the past few years during repair works to its steel frame. Now the Grade II listed lido needs attention. Brighton & Hove City Council in fact owns the lido and it is held on a long lease by Dennis Audley who hopes to build over 100 flats on the historic site. This is not the sort of attention that I envisaged! Fortunately, an exceptionally well organised campaign has been put together by local residents under the banner of the Friends of Saltdean Lido. They hope, and it is an idea that I support wholeheartedly, to fight off Audley’s plans for residential development and, instead, transform the lido into an attraction of which we can all be proud. An entirely appropriate architect, Paul Zara of Conran & Partners, has put together an altogether more suitable set of plans for the Friends. Sporadic opening hours, poor maintenance, unimaginative use of available space and appalling access currently plague the lido. No wonder it has been underused in recent years. Much greater obstacles have been overcome in the past though. The lido was in fact closed during the Second World War and did not open again until 1964. The northern section of the building was added during the 1960s and includes a distinctive terrazzo lobby and staircase. I recently bumped into the Friends of Saltdean Lido at the recent Art Deco Fair at Hove Town Hall. Some suitably iconic merchandise has been created including bags, calendars and badges (I’m actually wearing one as I write so they must be cool). Their next outing takes place on Sunday 21st November at the Art Deco Fair at Lewes Town Hall. There are many ways to help – please see www.saltdeanlidocampaign.org or contact Rebecca Crook on saltdeanlidocampaign@googlemail.com to get involved. New Church Road, Holland Road, Lansdowne Road and Palmeira Avenue in Hove are each home to a synagogue, as is Middle Street in Brighton. How many people though are aware of the synagogue on Brunswick Terrace in Hove? The portion of Brunswick Terrace to the west of Brunswick Square consists principally of townhouses of five storeys including the basements and roof rooms. But on close inspection, the central house, No. 26, has an extra floor above, seen from the street as a small room topped with a miniscule dome. That room was added to the building as the private synagogue of Philip Salomons who lived in the grand house below with his family. Salomons was a Jewish financier and, indeed, one of the founders of the London & Westminster Bank (now NatWest). He served locally as both High Sheriff of Sussex and Deputy Lieutenant of the County, and, like his father, he held the position of Warden of London’s New Synagogue. The roof-top synagogue is essentially a pedimented box with windows looking out over the lawns and sea below. The architect is not known. It was once home to Salomons’ famous collection of Judaica but now contains just a single bench seat along one side. Its Tablets of the Ten Commandments are now preserved in the collection of the Salomons Museum in Tunbridge Wells. 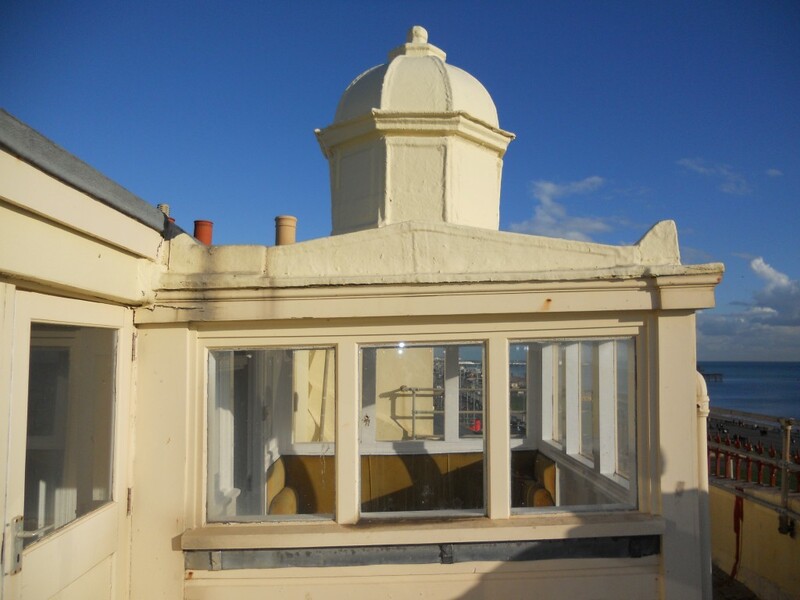 The room is topped with an octagonal cupola sitting on an octagonal drum. The tradition of building synagogues with octagonal domes may be attributed to the belief that that the dome of the Holy Temple in Jerusalem was octagonal. 26 Brunswick Terrace really does deserve a column in its own right as it may well be the largest house in Brighton & Hove (not including the Royal Pavilion of course). It is true that it is now divided into flats but, as a single residence, its gross internal floor area must be somewhere in the region of 15,000 sq ft. A typical Brunswick Terrace house is huge but No. 26 is over three times the size of its neighbours and stretches right back to Brunswick Street West behind. The Salomons family occupied the whole building from the early 1850s but a fire in 1852 led to a move to 18 Brunswick Terrace whilst repairs were carried out. Things are hopefully more peaceful at No. 26 today – the building is now home to the Noise Abatement Society!